A New York federal court has ordered Nicholas Gelfman and his investment firm, Gelfman Blueprint Incorporated (GBI) to pay over $2.5 million in fines for fraudulent practices. The action, as filed by the Commodity Futures Trading Commission (CFTC) marks the first time the Agency has made an anti-fraud enforcement involving Bitcoin. According to CFTC press release, Gelfman and his New York-based firm claimed to have “Jigsaw,” a high-frequency trading computer software that has the capability of mining profits from Bitcoin. However, the claim turned out to be false as they had presented fake performance reports to investors and then made payments to GBI customers that consisted other customers’ misappropriated funds, thus making it the hallmark of a Ponzi scheme. The law enforcement agency further revealed that Gelfman’s real trading account records showed only infrequent and unprofitable trading. However, in an attempt to conceal the fraud, he staged a fake computer ‘hack’ that supposedly caused the loss of funds belonging to nearly all the customers. Gelfman and his firm admitted to the charges and are now ordered to pay over $4.9 million and over $5.5 million respectively, in restitution to customers and over $1.7 million and over $1.8 million in civil monetary penalties. The agency, however, added that the victims may not be able to receive restitution because Gelfman’s does not have sufficient funds or assets. Moreover, the fraudsters have been banned permanently from trading and registration in the United States. The CFTC will continue to fight vigorously for the protection of customers and to ensure the wrongdoers are held accountable. The law enforcement agency claimed back in July 2018, that a Bitcoin pool operator, Dillon Michael Dean and his UK-based company have fraudulently obtained almost $500,000 worth of Bitcoin from at least 127 investors who wanted to partake in a pooled investment vehicle for trading commodity interests. CFTC later ordered Dean and his registered firm, The Entrepreneurs Headquarters Limited (TEH), to pay almost $500,000 in restitution to customers. In addition, over $1.4 million civil monetary penalties were paid, bringing the total amount owed to about $2 million. The BTCUSD pair was marked by a short bullish candlestick on the first day of this week. Then, on 15 October, the number 1 digital coin saw its price rally against the US dollar as it jumped to a high of over $7,000. Afterward, the price started to decline which eventually saw the virtual currency erase most of its gains from the day. At the moment, retracement has pushed the BTCUSD pair southwards to slightly below the notable stable price mark of $6,750. 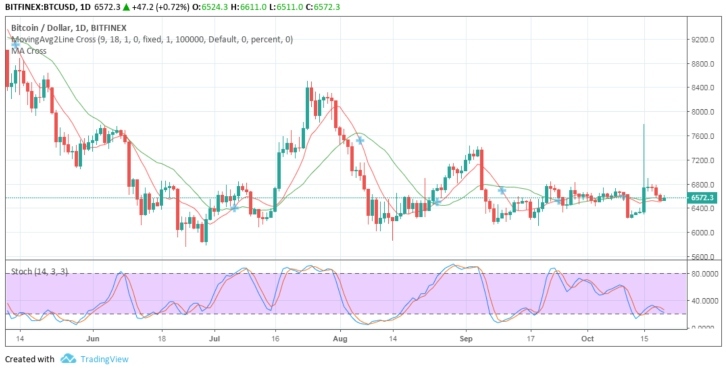 Both its Simple Moving Averages (SMA) are moving closer to each other and retaining the same positional directions between the $6,750 and $6,500 range. The Stochastic Oscillators have also moved past range 20 and are pointing south. This indicates that the bears are presently in charge in the market. The price territories around $6,250 and $6,000 seem to be the BTCUSD’s strongest supports. Nevertheless, a move below these areas may lack a long-term sustainability as it can turn out to be a bear trap. Whenever a strong bearish reversal occurs, traders may look to enter a long position.